"As an Interior Designer it is important that I give my clients the best products and services available. Napco has consistently proven to be a top-notch painting contractor. They have not only painted the interior and exterior of my clients homes (as well as mine! ), but also do an amazing job painting and glazing existing cabinets to make them look amazing." Napco Painting Contractors Inc. has been in business for over 20 years. 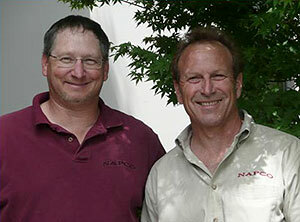 Jon La Field of La Field Painting and Bob Zimmerman of Magic Brush Painting built Napco to service residential and commercial customers in the Napa Valley. Joe Winograde ran a successful painting business for 12 years in Napa Valley before joining Napco in 2005. Bob Zimmerman passed away in 2007. Napco is licensed by the California Contractors State License Board and is a proud member of the Painting and Decorating Contractors of America. The PDCA is a prestigious nation wide organization founded to promote professional standards in business ethics, painting quality, professional service and business success in the painting industry. Napco is an active member of the Napa Chamber of Commerce and Napa Rotary Club. Napco is also proud of our involvement painting community projects. It is our mission to satisfy each customer. It is important that each customer receives our undivided attention and best of what we can offer. Our business ethics require us to provide proper insurance, accurate payroll procedures and excellent benefits to our employees to attract the best painters to give first class service and provide security for our company's future. When looking for a painting contractor, be sure you select a company who will be in business to support their warranty and continue to provide high quality service in the future.